Good Morning! I hope you're all doing well and ready for the New Year. I am looking forward to tonight, just hanging out with my kids and ringing in the New Year with a bottle of sparkling cider. 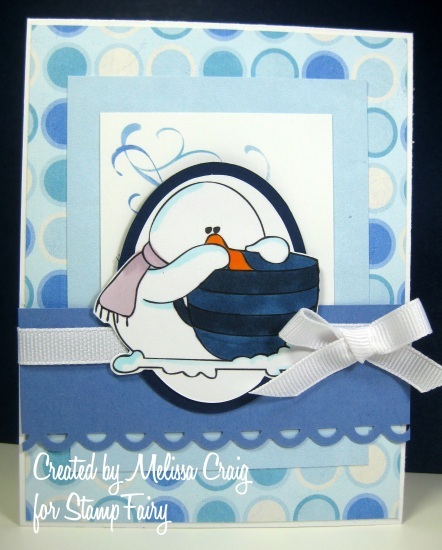 Gerda at StampFairy is releasing another adorable snowman set, today's card features one of those images - this is George. I did use the sketch from Sweet Sketch Wednesday. I enjoyed playing with one of Arlana's sketches, I haven't done that in a long time. 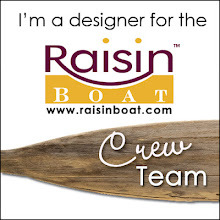 Hi Arlana, Nancy and Judy and team! Hope you're all well and that you had a very Merry Christmas and I wish you all the best in the upcoming new year. 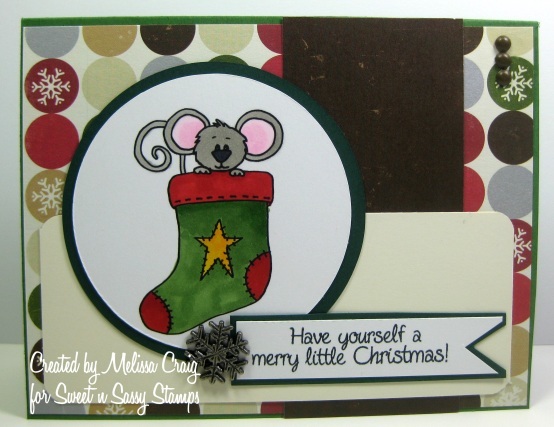 I hope you enjoy the card - it's the last one for 2010! I do wish each and everyone of visitors a blessed New Year that is filled with laughter, love and lots of stamping. Many hugs to you all. Oh! 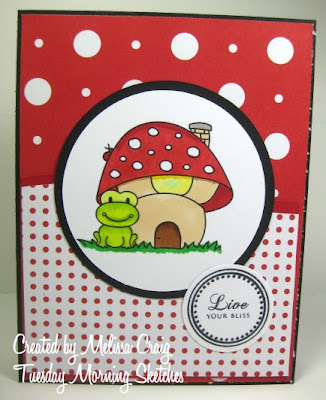 Be sure to come back on Monday to join us for the first StampFairy blog hop. Enjoy! Hello everyone! 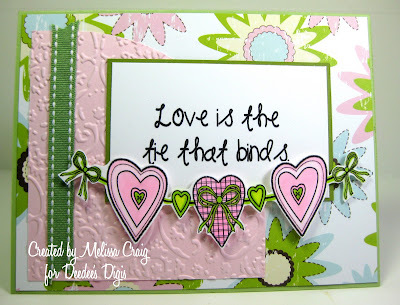 Deedee has created some really lovely Valentine images and I have a card to share with you that I am pretty proud of. This is called Stitched with Love. This set comes with these great hearts and sentiments, you can even grab one as a freebie - but really you want the whole set. Here I wanted the sentiment to be the focal image with the hearts embellishing the card. I think it turned out really nice and I hope you like it, too. 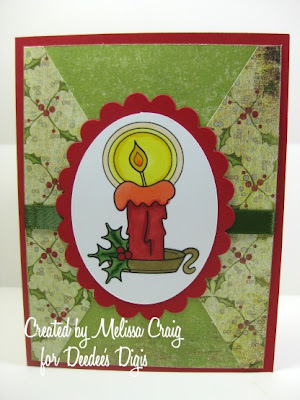 I did use a great sketch from Crafts 4 Eternity and the other part of the challenge was shades of green. 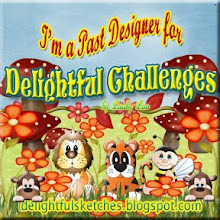 Be sure to head on over to the Deedee's Digis store to check out the other new images that Deedee created just for you. Don't forget all Christmas and New Year's digis are on sale for just $1!! Good Morning everyone! Is your week off to a great start? I sure hope so. I am really lovin' my sketch over at Tuesday Morning Sketches, it's an easy one. 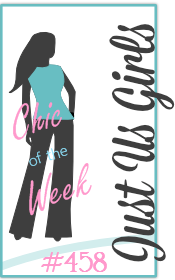 We also have the sweet Elizabeth of Soft Pencil sponsoring this week. You're going to want to head on over to her store, too and grab those images you've been putting off getting. Elizabeth is going to be retiring her current selection so she can freshen up the store with new ones. I can't wait to see them. I just love this little image that Elizabeth gave me to play with. So cute! This is a really easy sketch so I hope to see over at Tuesday Morning Sketches. ....I decide to have a play-date with the companies I design for. Hello! I hope you're all doing well and your Christmas plans are well in hand. The presents are wrapped, the tree is up and I think we're actually ready for Christmas here. I have a new friend that I met the day I interviewed for my job. She and I were destined to meet because it turns out she lives 7 minutes from my apartment and we got put on the same schedule so we carpool. She is such a great friend, that I felt I needed to do something for her. We talk about a lot of things on the way to work and one of the frequent topics is recipes. 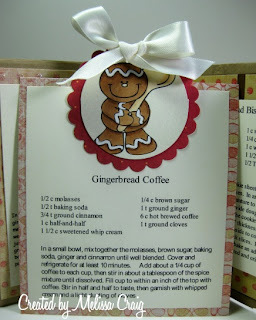 With that said, I created E a paperbag cookbook and I incorporated some adorable digis from the companies I design for. My plan was to share page by page everyday this week - but it didn't quite work out that way. Here's the cover - these digis are from the very sweet set Lovin' from my Oven. Doesn't she remind you of Aunt Bee? The inside two pages also featuring an image from Lovin' from my Oven. 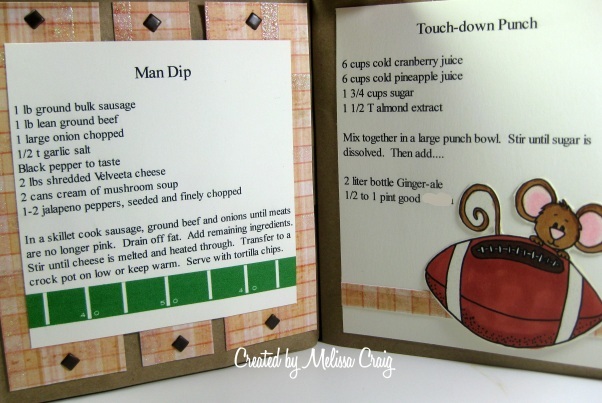 I decided it would probably be a good idea to include a couple of football recipes to include her husband who was a professional football player. Here's a close-up of Cocoa. Isn't he awesome?! And finally, StampFairy had to join the fun, too. 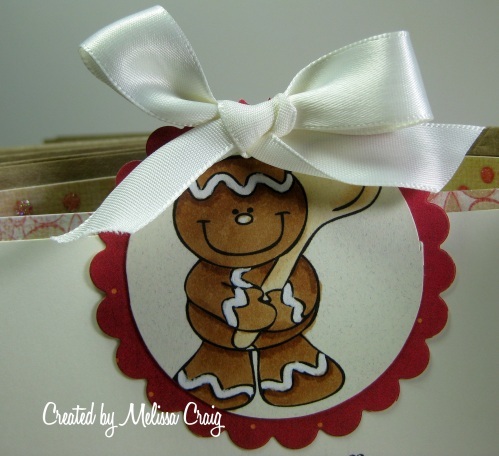 This sweet image is part of the Ginger Babies collection. This little guy is actually the pull tab, because this recipe slips inside one of the pockets that is naturally created when using paper bags to create a book. Well, I probably won't be posting the rest of the week so let me wish you a very Merry Christmas! I do hope that among all the wrappings, ribbons and cookies that the true meaning of Christmas touches your hearts and homes. Good Morning! It's Friday - whoo-hoo!! And there's only 8 shopping days left until Christmas. Are you ready? I am almost ready and I promised the kids we'd put the Christmas tree up this weekend. I have no idea where we'll get it to fit, but we'll manage, I am sure. I have to admit that I was getting a bit, plainly put, tired of Christmas cards. I love Christmas just as much as the next guy, but it seems I have just been creating Christmas cards lately, that I just needed a little break. So I created this card with the Lenny Thank You image from StampFairy. I was inspired by the great sketch from Crazy 4 Challenges. Isn't he cute? I really love the rich colors of this new mat stack that I got, too. 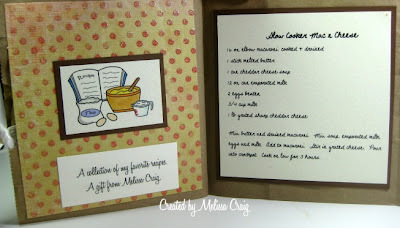 This card was really easy to make and doesn't have a lot of bells and whistles - but it turned out quite nice. I hope you like it. Thank you so much for stopping by. 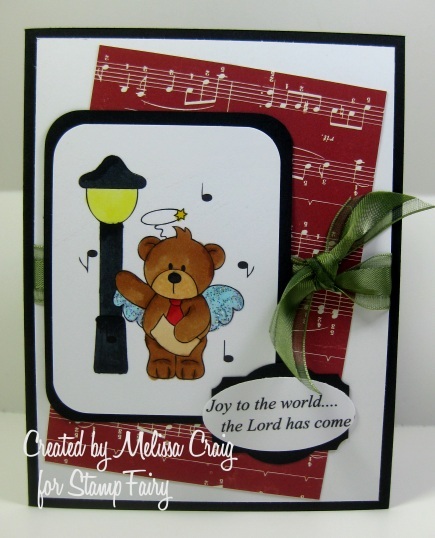 Be sure to head on over to StampFairy to see the newest release, too. Happy Friday! Good Morning! I hope everyone's week is going well. 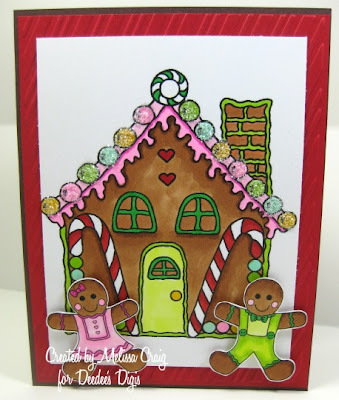 I have another card to share with you featuring another set from Deedee's Digis. 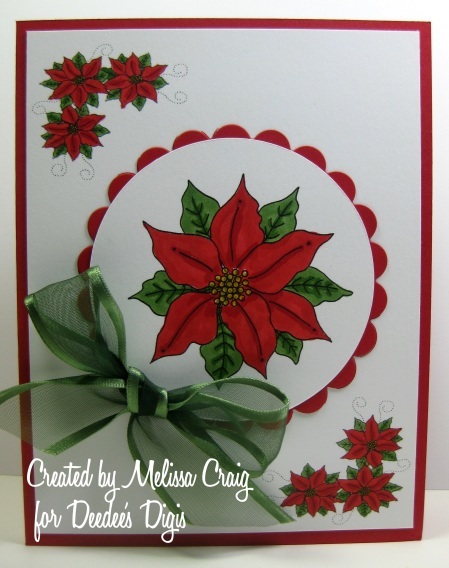 I love this beautiful poinsettia set, it's called Beauty of the Season. 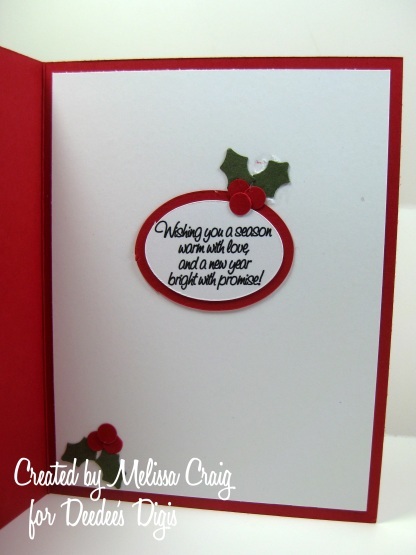 This card was a bit of challenge to make but I believe the final results are great. The first layer was the trickiest to get the corner poinsettia elements to fit the way I did, but with a bit of patience, trial and error and tweaking, I got it to work. There is still time to join us for the Happy Monday challenge over at Crafting with Deedee's Digis - this week's challenge is to create a something using Burgundy and Gold - my card doesn't fit the challenge, but I just thought you'd like to know and here's another piece of news.... all Christmas and New Year's digis are on sale for just $1. Now that's a great gift to give yourself and be nice and friendly to your wallet. Good Morning! 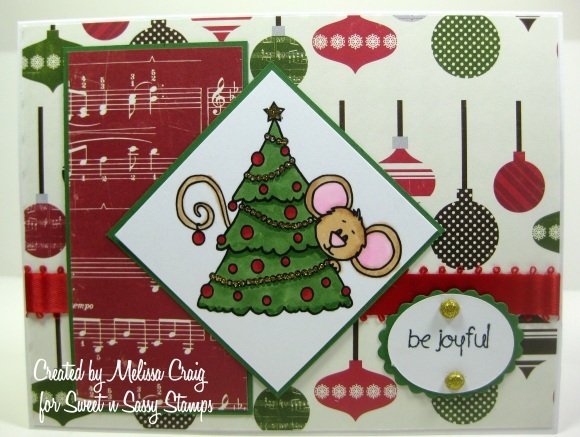 Thank you so much for joining us for the ABC Christmas Challenge blog hop! This is ABC's final hoorah for 2010. I hear 2011 has some great challenges in store for you. 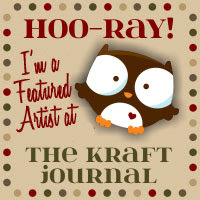 I am absolutely thrilled to be included in this blog hop and representing StampFairy. StampFairy is sponsoring this holiday party so you're sure to see some pretty adorable cards along the way. If you came here from Samantha's blog then you're on the right track for a whole lot of fun. 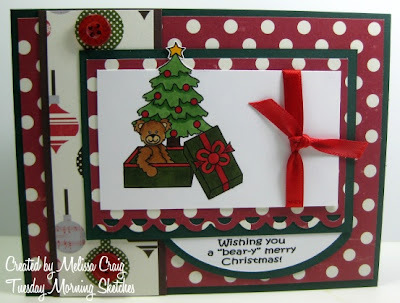 If you came here just to visit me and you want to join in the fun, start at ABC Christmas Challenge Blog. This Santa (4) image is so funny! My kids said that instead of "ho ho ho" being the sentiment, I should've used "help help help"! LOL I also drew help from the great sketch from Waltzing Mouse sketch challenge. Be sure to visit the blogs, there are surprises along the way. You'll also want to collect letters for a special treat. Now hop on over to Carissa's blog. Have fun! Good Morning and Happy Tuesday! As the cold temperatures still rock sunny Florida, it is at least feeling a little bit like Christmas. 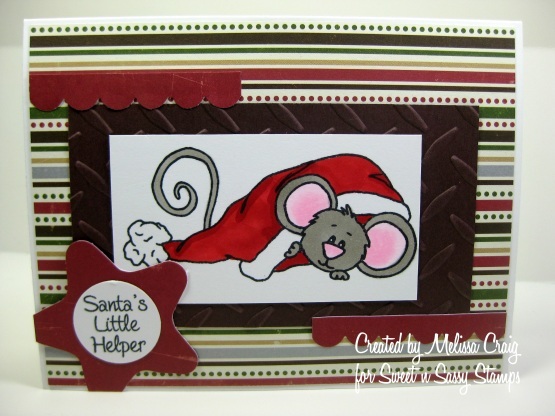 My card features the adorable images from the Berry Merry Christmas set. I think I'd love to find something this cute and cuddly under my tree. 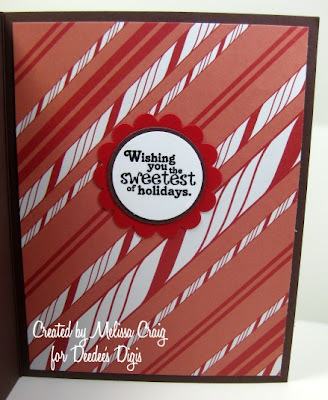 I also used more of the yummy papers from the Merry Christmas pack by Echo Park. I do hope that you'll join us at Tuesday Morning Sketches - it will be a lot fun, a little challenging and there's a great prize up for grabs. Good Morning! I hope you all had a great weekend. With it being a bit cold and windy and rainy yesterday, it sure made it really easy to stay indoors and at my craft table. Today's card is featuring Cocoa's Stocking, another new Cocoa image in the Sweet n Sassy store. How could anyone not love this little mouse? He's adorable!! 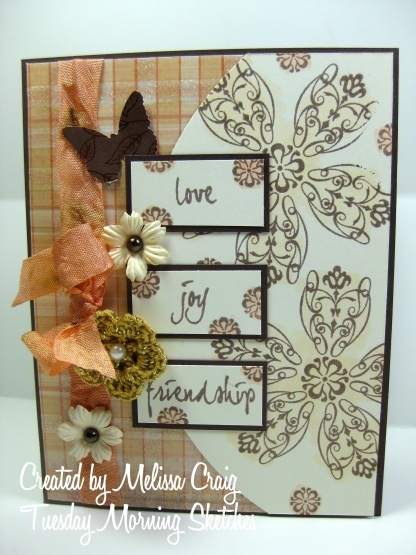 I did use the sketch from Our Creative Corner for the layout of this card and it was perfect! It went together so easily. 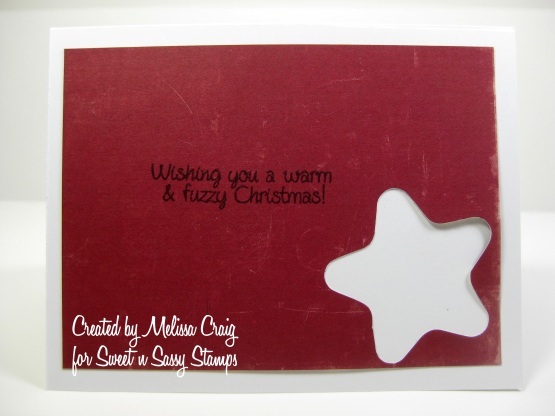 Again I am featuring the lovely papers from the Merry Christmas sampler pack - I just can't get enough of this paper. I do hope you like my card and that it inspires you to create. 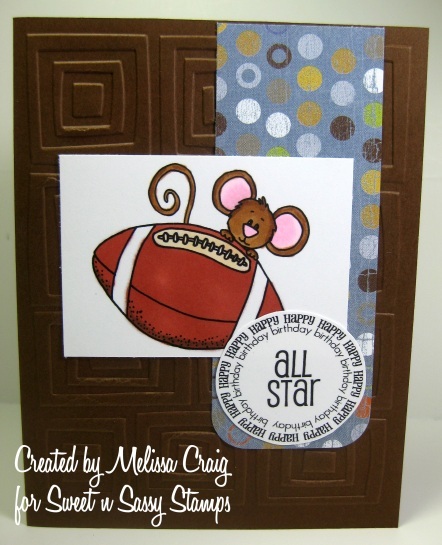 The new Crazy for Cocoa challenge blog is up and running and the store is always open. Happy Monday! Good Morning! I am soooo glad it's Friday. I'm looking forward to a low-key weekend and hoping for some quality crafting time. I need to finish up some Christmas cards and get them ready to mail. 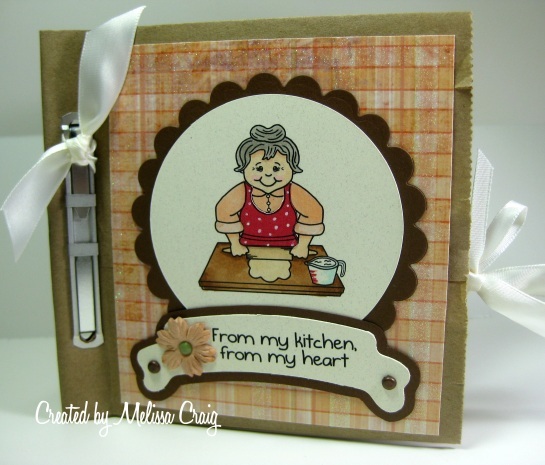 Here's my card using an adorable image from StampFairy. This is Donny Christmas Angel (5) and he's rejoicing the Season. I did use the sketch from Truly Scrumptious as inspiration for the layout of the card - it came together so easily, I love sketches like that. Thank you so much for stopping by and I wish you a very happy weekend. Good Morning! I have a really fun sketch over at Tuesday Morning Sketches and we have a returning favorite sponsor, Roberta from Prairie Fairy Designs is with us some great holiday images. 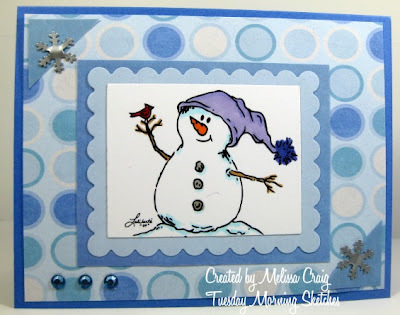 I am featuring a very sweet snowman from Prairie Fairy Designs and digi paper from A Cherry on Top. The sketch is really easy to use and I think you'll have a lot of fun. 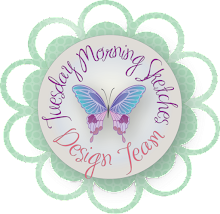 I do hope you'll join us this week - now head on over to TMS to get fabulously inspired by my very talented design team. Good Morning everyone! I hope you all had a great weekend! Ours was pretty busy, but all in all, pretty good. It's chilly here in sunny Sanford, FL - lows are dipping into the 30s, highs are in the low 60s and I guess it'll be like that for the whole week. I am just happy the weather was beautiful for the Christmas parade this past Saturday. 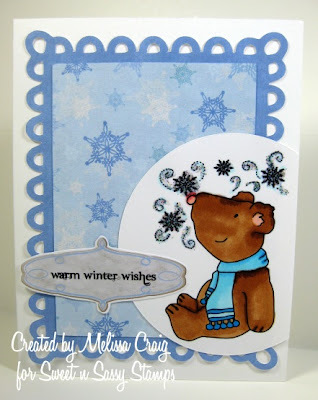 So here's my card share for today - this features another new image from Sweet n Sassy Stamps called Snowflake Bear. He's so cute with the snowflakes swirling about his head. I did use a really great sketch from Papercraft Planet (#120410), I've never played along with their sketch challenges, so this was fun and it's a great sketch! Really easy to work with. This was a lot of fun to put together! So I wish you a very happy Monday, thank you so much for stopping by. 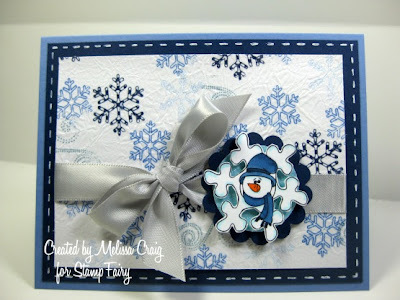 Alright so this week's theme is to create a winter card - so the obvious is to pick an image that is all about snow, snowflakes, snowmen - that makes it pretty simple, right? Well, I decided to challenge myself a little further and see if I could create a winter card out of an image that is probably more fitting for Spring/Summer. So here is Whimsical Girl all dressed in her winter gear holding some flowers. I embossed the image with the Swiss Dots embossing folder after I colored the image to create the snow falling down. I highlighted some of the snow that is falling on her with a white gel pen. I did flatten out the embossing on her face so she didn't look like she had mumps and I really could've flattened other dots randomly so that the snow didn't look so uniform, but I still love how this looks! Then I set out to find the perfect sentiment. I chose a quote by J.M. Barrie, the author of Peter Pan. It says "God gave us our memories so that we might have roses in December." By the way, a word about the layout of the card. I used a Mojo Monday sketch that is from their 2009 pdf sketch booklet. I love this and will be referring to it often. 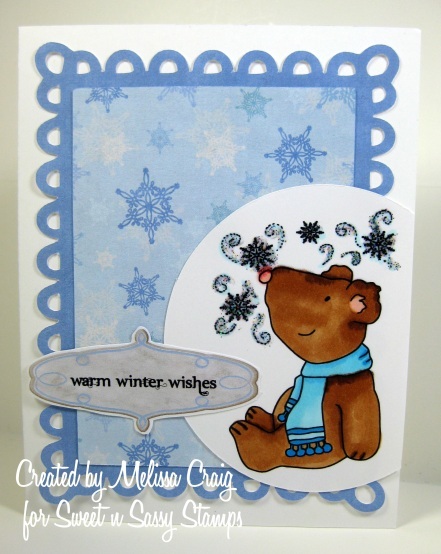 Now head on over to Bee Crafty to play along with us. And you have got to see Joni's card - it is totally fabulous! No surprise there, right? Also, leave a little love for our sweet Deanne who is quite under the weather. Have a fabulous weekend.... we're off to prepare for the Christmas parade that Hollyanne's dance school is in. Hi Everyone! This is my 2nd post today, please be sure to scroll down to see the card I made for StampFairy. 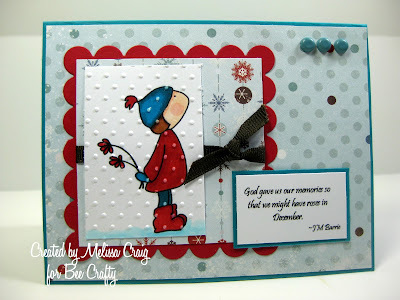 We are into day 3 of the December releases from Sweet n Sassy Stamps and they are simply fabulous. 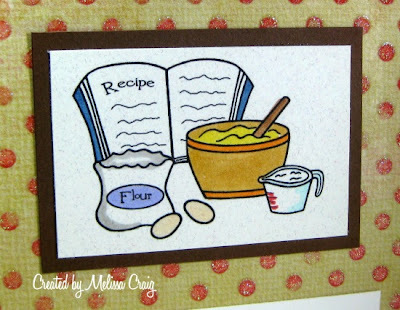 This stamp set was part of last month's release I just had to share this card with you! I did create this card using the wonderful sketch from Crafts 4 Eternity (that I am barely getting submitted in time) with the additional challenge to have a star somewhere on the card. 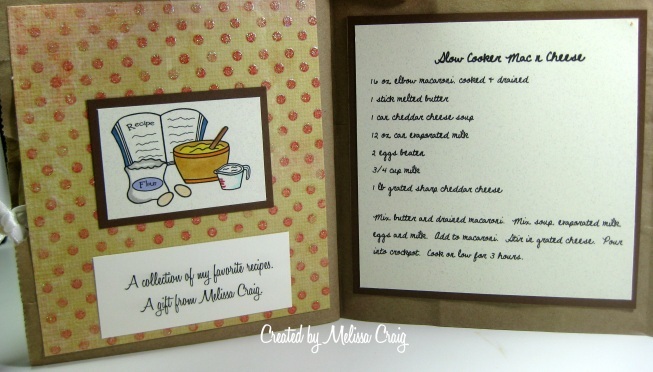 And here's a view of the inside of the card that boasts a sweet sentiment that is also included in the stamp set. Oh! And did you hear the news yet? We all love Cocoa so much that Korin has decided to start a challenge blog called Crazy for Cocoa. To play, your card or project must feature a Cocoa image. And there is a fabulous prize up for grabs. Be sure to visit the blog, become a follower and player - it's going to be great fun. Good Morning! Hip-hip-hooray, it's FRIDAY!! I am so excited that the weekend is almost here. I have just been waiting and waiting for today to show you this card. You all know how I feel about snowmen. And if you don't, well, let me tell me you.... I love love lovey them sooo much! This card features one of the adorable Joey Snowman (6) images from StampFairy. My monthly card traders group issued a challenge we called 'hot tissue.' Many have done this technique with pretty napkins, but this time it was supposed to be with pretty tissue paper. 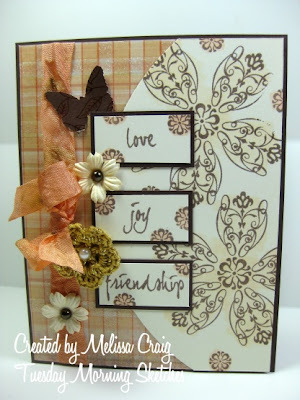 I didn't have any in my stash, but I did have white, so I made it pretty with my stamps. Then you crumple it up, smooth it out and iron it onto a piece of cardstock with a sheet of plastic wrap between the tissue and card stock. I hope you enjoy my card and that you can see why I was so excited to share it with you. I think it's really cute! 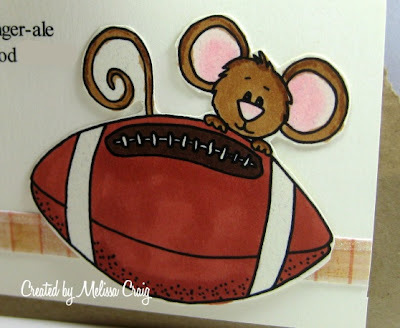 Be sure to check out what the rest of team made to share with you, too, over at StampFairy World.